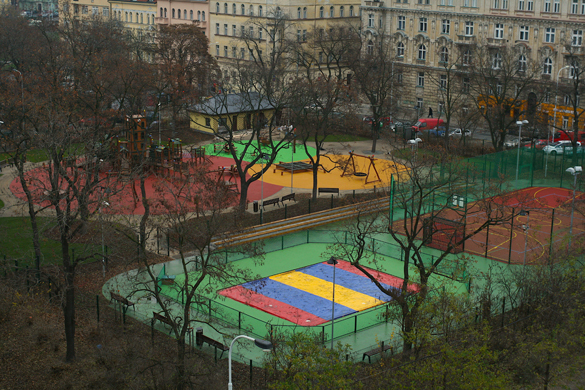 One of the newest playgrounds in Prague and a star attraction, drawing in kids from all over the city. U Vodarny (Watertower) playground was revamped completely at the end of last year. It is heaps of fun, it’s big but be warned it’s often very busy! NB: Thurs 22 April, 2 to 6pm the playground is hosting an afternoon of fun games and exercises for kids. Parents can also learn about fitness, nutrition and healthy eating. The traveling program run by P2 council will visit Grebovka 29.4, Riegrovy Sady 13.5, Folimanka 18.5 and end 20.5 at Na Vytoni it’s first day of operation after complete reconstruction. An absolute pleasure for kids all ages is the large trampoline that is inflated every morning before the playground opens. This is the draw card that has families and larger kids traveling across town to experience. Luckily for us we’ve been on overcast mornings and on weekends when crowds are at a minimum so Lucie (almost 4) can jump and enjoy the experience without being trampled upon - which from what I have been told has been the experience for some of the smaller kids. It is unfortunate that kids as old as 13 or 14 can be leaping up and around the smaller ones but who can deny them their fun. Just approach with caution when attending with little ones, or skip it altogether if it resembles a mosh pit. There is no way your child will feel deprived when so much else is on offer - the central climbing frame is magnificent. A fun tower sits in the centre of the huge complex and beautifully replicates the water tower across the road. Kids can climb, slide, run over chain bridges or use the zip line to access the tower. Large sand pits are in abundance and there is also a gigantic basket swing great for small babies or multiple groups of kids, plus the usual conventional swings with climbing frames attached. A brand new basketball court is also on site and there are plenty of benches about for sitting and relaxing. The park is south facing so receives plenty of sun (when the sun chooses to appear!). The area is also very large and flat thus suitable for bikes and scooters, especially when it’s completely covered in rubber matting. Also onsite is a water fountain, toilets and a full-time caretaker. The nearest kid-friendly restaurant is Pizzeria Gusto so it’s possible to make a day trip over this way if you live out of the area. Transport links are also great as the park is very close to metro line A and several tram lines. OPEN: Every day. May to September from 8am till 9pm. October to April from 8am till 7pm. DIRECTIONS: By Tram take 11 to tram stop Jiriho z Podebrad or trams 16 or 10 to Vinohradska Vodarna. By Metro catch the green A line to metro stop Jiriho z Podebrad. Paid parking available in Vinohradska ul.